When the city fathers were planning to expand the population of the city in the 1970s, they settled upon the green field site of Bowthorpe to the west of the city. Bowthorpe was a historic parish, but it had almost entirely lost its population by the 18th century. The City planned to build three new villages on the site. What happened next is detailed on the entry for the modern Bowthorpe Church Centre. All that had survived of the old Bowthorpe was the Hall and the ruined chancel of the parish church of St Michael. 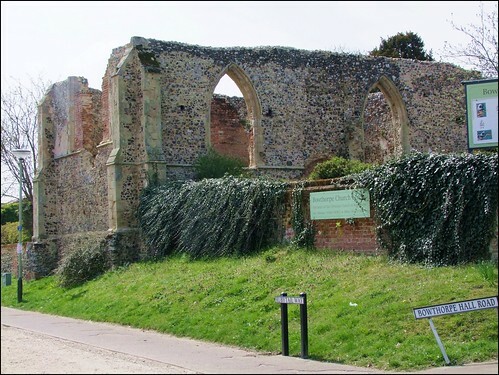 As often happened in the immediate vicinity of late medieval East Anglian towns, the population here was drained away by people moving into the urban area, and there was no further use for the church once the 16th Century Reformation had robbed it of its sacramental purpose. It seems to have become a barn in the second half of the the 16th Century, although Pevsner suggests that it was repaired and restored to use at the rather curious date of 1636. Was this an act of Laudian piety perhaps? Whatever, the roof collapsed in the 1790s, at which date the church was finally abandoned. This was a large, round towered church, although nothing now remains of the nave and tower above ground. Their footings were discovered when the new church centre was built adjacent to the ruin, and both may well have collapsed long before St Michael fell out of use. Although all that has survived are the chancel walls to about three-quarter height, the ruin is substantial, a pleasing mixture of red brick and flint, and it has been consolidated so that it is quite safe to explore it. St Michael forms part of the Bowthorpe Garden of Remembrance, and as such is open all the time. Through the attractive Norman-style entrance ways you follow a diagonal path into the body of the church. There is a cross where the altar would once have been. As the only old building in the entire township of Bowthorpe, it continues to hold a special place in its community.